The 2017 report from America’s Health Insurance Plans (AHIP) found that Medigap Plan N saw a 27% increase in enrollments between 2014 and 2015. 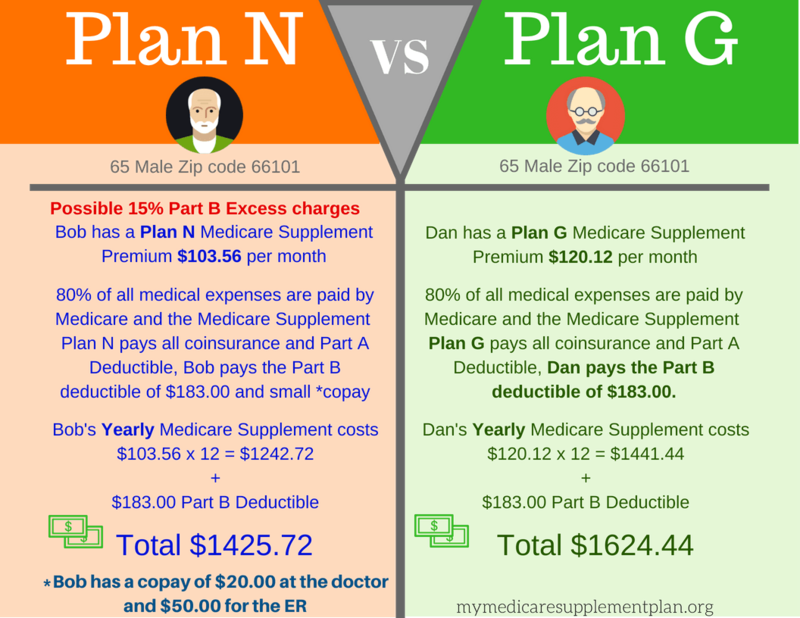 Introduced almost eight years ago, Plan N offers a unique option to Medicare recipients who are looking to save on premiums in exchange for a small deductible and copay. When comparing plans, the Medicare supplement plan N is very similar to Plan D, though AHIP found that Medigap D saw a 10% decrease in enrollment during the same time period. In essence, a Medicare supplement plan N allows you to reduce your monthly payments by paying a little bit more every time you do visit the doctor, but it is always a predictable copay rather than a variable percentage of the service charge. The goal of every Medicare supplemental insurance plan is to reduce or eliminate the out-of-pocket expenses associated with Medicare. These typically come in the form of copays, deductibles, and coinsurance, and Medicare Plan N covers the most common surprise charges that Medicare recipients are trying to avoid. It’ important to remember that Original Medicare Part B is primarily responsible for covering the costs of a beneficiary’s preventive care. Preventive care includes services like annual physicals, cancer, and diabetes screens, and tests needed to monitor cardiovascular conditions. Medicare beneficiaries will pay nothing out-of-pocket for PREVENTATIVE services. Doctor and specialist visits that are non-preventative, things like treatments for injuries or illnesses are also covered under Medicare Part B but beneficiaries are responsible for the coinsurance which is 20%. This means that when you receive treatment for illnesses and injuries which typically includes diagnostic tests, medical equipment, surgery, lab work, and many other services, Medicare pays 80% of the costs and your Medicare Supplement Plan N takes care of the other 20%. 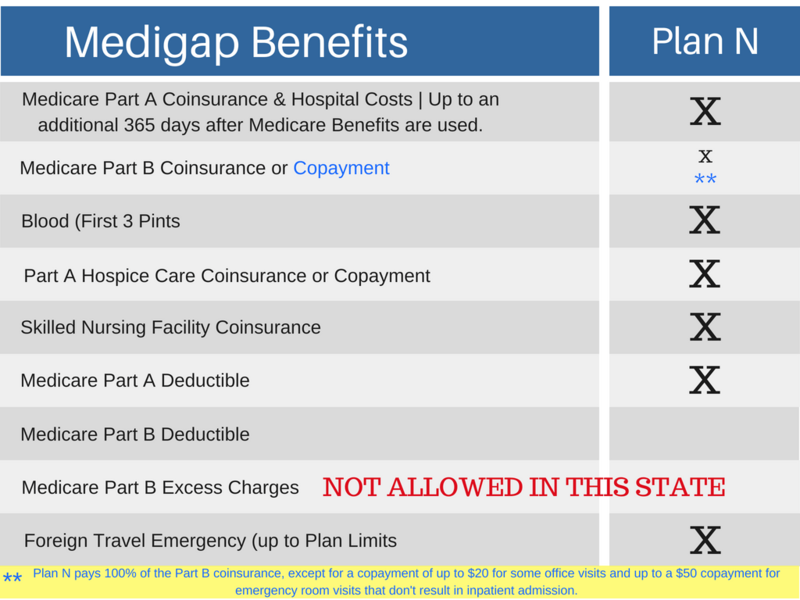 Part B Copay with Plan "N"
While you might think that these costs are a reason to avoid Medigap N, they actually account for its popularity. These small, predictable copays are what allow the plan’s premium to remain low compared to similar Medicare supplements. When a beneficiary needs inpatient hospital services, hospice care, blood transfusions, skilled nursing care, and home health care, Medicare Part A provides the coverage. Although there is typically a deductible for your stay in the hospital ($1,340 for 2018), your Medicare Supplement Plan N will pick up that cost on your behalf. Other hospital related services that are covered under your Supplement Plan N are listed above. Who Is Medicare Plan N Best For? Medicare Supplemental Insurance Plan N covers most of the available charges, but it doesn’t cover all of them. Specifically, it doesn’t cover the Part B deductible ($185 annually for 2019) or Part B Excess Charges. The deductible is relatively low, so it doesn’t play much of a role in determining whether or not Plan N is for you. The Excess Charges, however, are an important consideration. Some Medicare supplements will cover excess charges, but Plan N does not. So, if you are certain that your favored doctors do not charge more than the assigned fee, Plan N could be the one for you. If you don’t want to risk or worry about the hassle of potential excess charges, you are better off with a different Medigap Plan. In most states, doctors who accept Medicare are permitted to charge up to 15% higher than Medicare’s “assigned fee” for any given medical service. If your doctor does include any of these excess charges, however, you are expected to pay them. The following states do not allow the part B excess charges making the Medicare supplement Plan N a great choice. 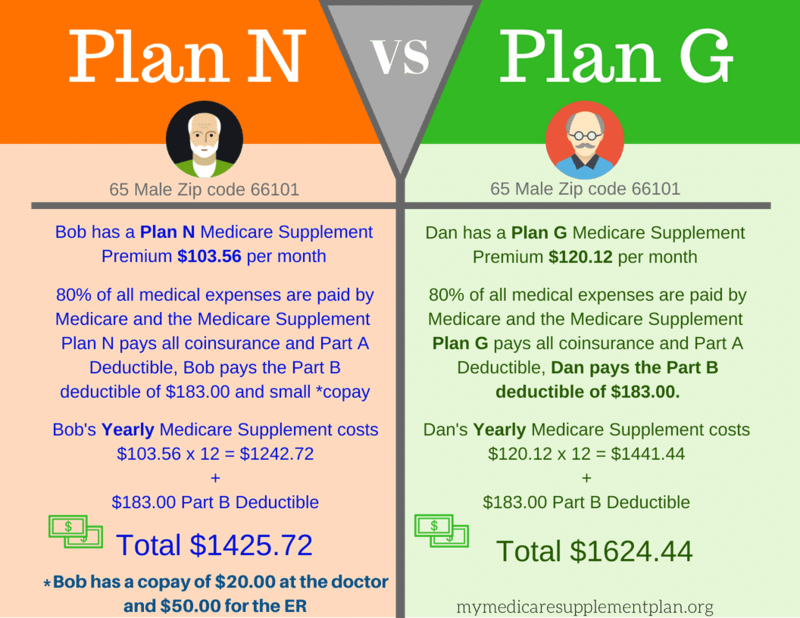 At first glance, Medicare supplement Plan N and Medicare supplement plan G seem identical. As far as a checklist of benefits goes, they would both have all of the same boxes checked. The only difference is that with Medigap N, you’ve got those pesky copays to take care of. Well, while insurance prices vary based on the provider, the average monthly premium for Plan G is $150 greater than Plan N. That means that in order to make Plan G worthwhile, you’d likely need to have more than six office visits every month of the year. When you look at the difference in premiums, Medicare Plan N wins the race against Plan G in almost every single case. 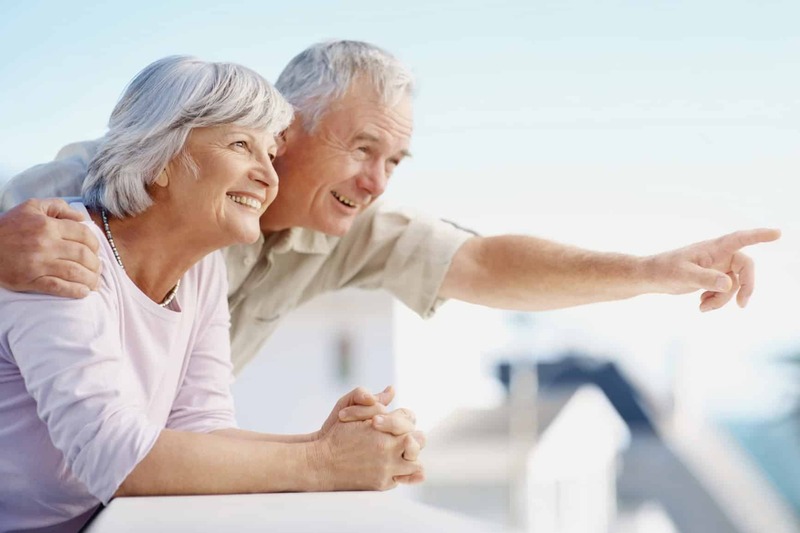 Although Medicare Supplement Plan N is becoming one of the most popular Medicare Supplement Insurance Plans, Medicare Supplement Plan F is still considered the most comprehensive. Plan F also offers a high-deductible version for enrollees who are looking for comprehensive coverage but are willing to pay a high deductible in order to cut their Medicare Supplement costs significantly. Covers the coinsurance and other hospital costs under Medicare Part A and offer up to 365 additional days of coverage when your Medicare Benefits have exhausted. If you elect the high-deductible Medicare Supplement Plan F, you’ll be required to pay the deductible out-of-pocket before the Plan F coverage will kick-in. Most importantly, since the Supplement Plan F provides the most comprehensive coverage, it is typically the most expensive plan available. For enrollees who have illnesses that require frequent doctor or hospital visits, Medicare Supplement Plan F could actually end up costing less than other plans with lower premiums. If you elect Medicare Supplement Plan N, you would be responsible for the above-mentioned charges out of pocket. Also, there are some cases when Plan N will require the enrolled to pay up to $20 in co-payments for certain doctor visits and a co-payment for emergency room visits that don’t result in admission to the hospital. Ready to Enroll in Medicare Supplement Plan N? 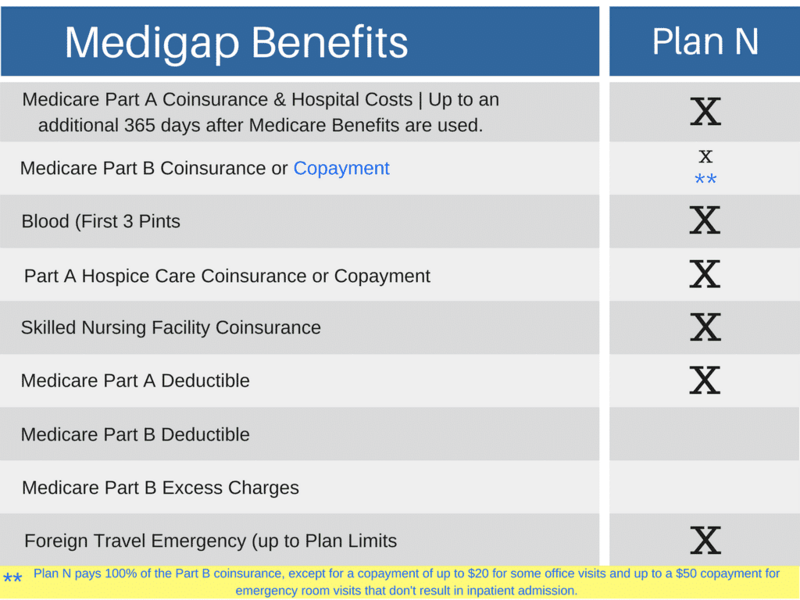 If you are looking to extend your Original Medicare benefits in order to cover some of the most common out-of-pocket expenses without breaking the bank on monthly premiums, Medigap N may just be your best choice. There are others to consider, though. Plan G, for example, also covers Part B Excess Charges without too high of an increase on premiums (and no copay!). If you are looking for help navigating the sea of information on Medicare supplements in order to find the best choice for you, reach out to us at 844-528-8688 or via our online contact form. Our services are always 100% free to you.